The Wizards' home win streak ended Monday night, but WTOP's Noah Frank says that through the epic game Washington gained more than it lost. WASHINGTON — It is said that there are no moral victories in professional sports, but there are certainly Pyrrhic ones. 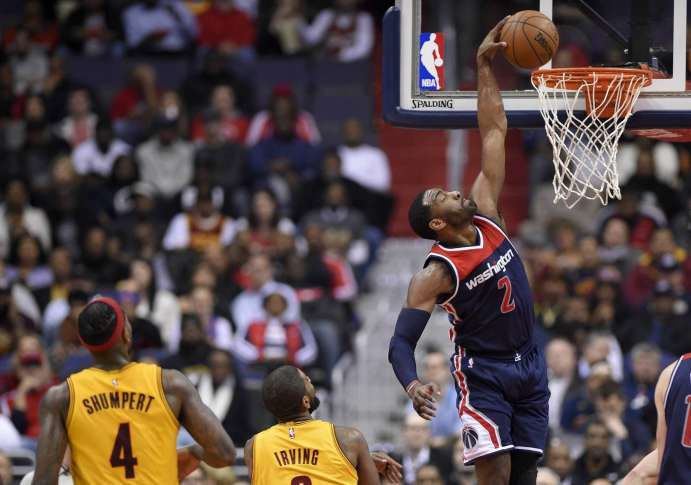 So it was that in the midst of their first home defeat of the calendar year, the Washington Wizards did far more than just acquit themselves Monday night against the defending champion Cleveland Cavaliers at Verizon Center. Cleveland came away the winner, but at the expense of showing the league that their very best game was only good enough thanks to a miracle shot from LeBron James. Wizards proved they belonged, taking every one of the Cavs’ best shots and staying standing until the end of the 140-135 “instant classic,” as head coach Scott Brooks called it. This was the way the home win streak would end: with a banger, not a whimper. “We wanted to play well, and we did. We wanted to win, and we didn’t,” said Brooks afterward. It was a simple remark — clichéd, even. But it’s worth considering the implications. Yes; it would have been nice to — you know, win the game. It would have been a statement to beat the champs and extend the home winning streak to 18. But if they’d done so without getting Cleveland’s best shot, without each of the Cavs’ stars playing up to their potential, hitting huge bucket after huge bucket, most people would have forgotten by Tuesday night. Instead, Cleveland needed every bit of talent, and luck, and maybe a missed call on the sideline, to pull it out. Recency bias is a hell of a drug. But if that wasn’t the game of the year in the NBA so far, you’re going to have to make a compelling demonstration of which one was. Better break out the Power Point and bring your projector. Until the final two minutes, the Wizards’ win probability never rose above 78.7 nor fell below 26.9 percent. The win probability swung back and forth across the 50 percent line 12 times in the final quarter and a half, including three times in the final 3:14. It culminated with a 96.3 percent probability with 3.4 seconds to play, the Wizards leading 120-117. And then, well. The narratives coming into the game were permutations of the common tropes that surround both win streaks and the oblique notions of establishing respect. Both Wall and Beal admitted after the morning shootaround that it was something of a measuring stick game. Wall acknowledged again what he had said on the broadcast after Washington’s win Saturday over New Orleans — that Monday night was the biggest regular-season home game of his career. That would go down as the understatement of the evening, but not the most foreboding of his pregame remarks. “As long as we play the right way, win or lose, we can deal with the results,” he said. After getting flexed out of prime-time games earlier in the year, the Wizards found themselves slotted into a prime-time national television game Monday night. A day after the Super Bowl, there were questions about the Super Bowl, because there have to be questions about the Super Bowl. But where that game featured a singular, unbelievable comeback, Monday night’s game was an over-the-top, cinematic boxing match, each side trading and absorbing more blows than they should be able to handle, gazing upon the wreckage they’ve wrought through their own bloodied, puffy eyes. Both Wall and Beal talked before the game about how upset they were with their three-point defense in the first meeting between the teams, a 105-94 Cavs win in which they shot 14 of 33 from deep. Monday night, Cleveland exploded for 19 threes on 38 attempts, a cool 50 percent, including hitting six of their last eight over the final 4:18 of regulation. They out-shot the Wizards 53.3 percent to 50.5 percent overall. They out-rebounded the home squad by three. They got 39 points from Kevin Love and a career-high 17 assists from James. And in spite all of that, it took an insane, once-in-a-career shot from LeBron just to get the game to overtime. And all of America got to see that play out. The winning streak drew the media hordes and the national television coverage for the game. But the performance Monday seared into the collective consciousness of the basketball world and, to be sure, the Cavaliers. Cleveland, which has 10 players averaging 15 minutes per game, shortened its rotation, with just seven players earning more than 12 minutes of floor time, despite an overtime affair that saw James foul out with four minutes to play. The Wizards got the Cavs to give them a playoff game in the regular season. They’ve seen Cleveland’s top gear, and they know they can match it step for step. Monday’s crowd was also, by all accounts, the loudest of the season — a far cry from the lackluster opening-night reception. That, too, is something opponents such as the Cavs and everyone else now knows they have to reckon with. Walking out of the arena, the reaction-shot girls — yes, those girls — were sitting at a table in the bowels of Verizon Center, still trying to grasp what they’d witnessed, recalling the shot to which their agape faces had become (perhaps unknowingly to them) instantly internet-famous. One muttered to the other. Maybe. But then Monday night wouldn’t have been Monday night.